P1? That's the nano polish. C2? That the liquid paint coating which must be applied to clean paint. P1 is a very different kind of polish. Breakthroughs in nano-structured composite materials allowed us to develop an incredibly uniform abrasive particle on the nanoscopic scale. This allows us to manufacture a polish that requires almost no lubrication, which offers three important advantages. The first is speed / effort. With many more active particles working the surface, the polish works faster with less effort than traditional compound abrasives. Secondly with virtually no lubricant, a P1 finish doesn't suffer "drop back". This is where the lubricants in a traditional polish hide minor imperfections, typically micro scratches in the polished surface, only for them to be revealed after the lubricants have washed off. With P1 what you see is what you get. Based on pure monomolecular silicium (SI14), C2 is a non-yellowing, high gloss, dirt repelling coating that cross-links with all surfaces of your car including bodywork, glass and trim providing long lasting (as much as 6 months from a single application) and exceptionally easy non smearing application. Completely repaint compatible (silicium or silicon should not be confused with man-made silicone which causes repaint issues) C2 can be applied to uncoated paint in concentrate form to seal paintwork providing great durability and exceptional gloss. It can also be diluted (5% product to water) and used as a quick detailer to provide that final touch and perfection to your car’s finish. Being chemically inert, C2 is compatible with every type of wax or polymer coating and can be used as a base layer or top layer. 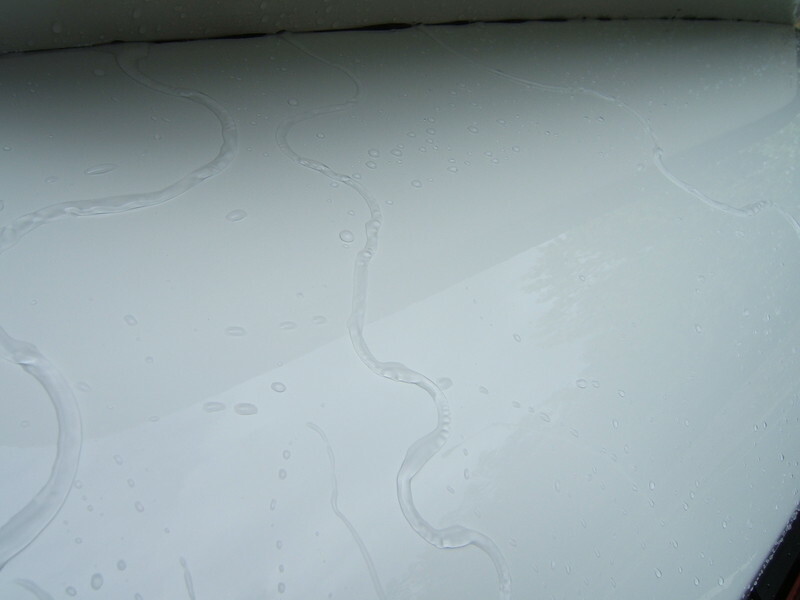 In fact we are so confident you will love the look, durability and ease of application we guarantee your previous favourite pot of wax will soon have a layer of dust on it and you will be out enjoying your car instead of labouring on removing wax residues from panel gaps and trim! For C2 Liquid Crystal Kit we recommend to perfect your car’s finish first using P1 Nanoscopic Polish and P2 Hologram Remover then apply C2 neat (wipe on, wipe off with a microfibre). You will need no more than 50ml of product for this stage. Once sealed you should then pour 25ml into the empty 500ml container and fill with water. You can then use this as your final quick detailer after washing your car (use once every 3 to 4 washes) to keep your car’s finish in perfect condition. Test subject? My white car boot. I've got Bilt Hamber Auto Balm on it to remind me what that product is like on outside panels (I used it in door shuts and so on) and ... I didn't like it, so it's gone. My intention is to use C2 up the sides of our cars. I don't really like waxing the sides of cars, much preferring top panels, so ... anything for an easy life I'll reserve top panels for waxes and sealants that I like to use. I washed the panel and then wiped it down with 50/50 IPA. I then polished it with P1 on a blue microfibre pad which didn't go as well as I thought it might. The polish is very dry, by which I mean kind of chalky although in no was scratchy. It just doesn't want to spread and I guess it's a better machine polish than hand polish - I gather it can dust a lot and you need to have a spritzer of water handy to keep it liquid. Being a "one" style polish which you work for as long as you need to I think it will be fine on machine - I hope so, since I've bought the corresponding pad and backing plate at a reasonable but significant price. Furthermore, it is nano polish and is said to "fill in" unevenness in the paint with nano particles. I say fill since it kind of is, but kind of isn't - either way it does it at a nano-level Like Carlack68 NSC? Next I applied C2 with a make-up pad remover. I inverted the bottle three times onto the pad and that was quite sufficient for the whole boot. I think twice would have done it ... and by invert, I mean hold the pad over the mouth of the bottle and turn it upside down. Yes, that little ... maybe a couple of millilitres! 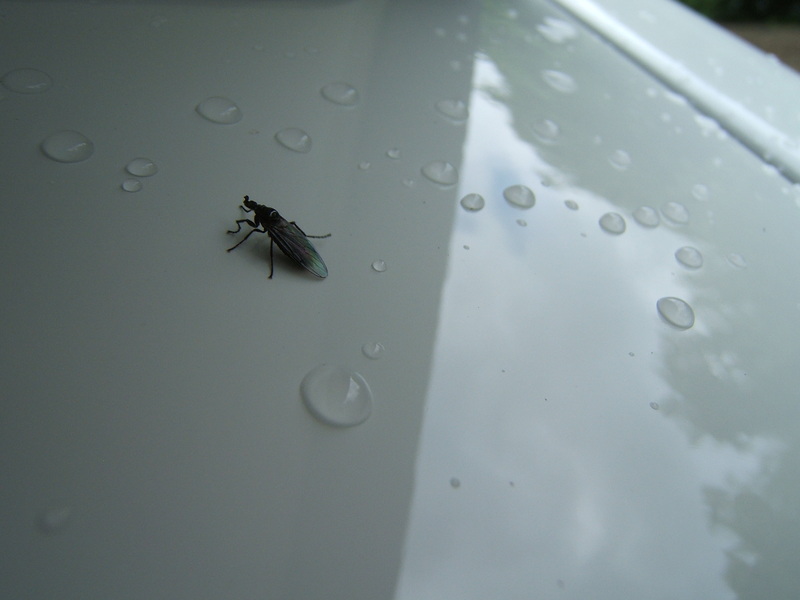 ... the streams are water falling through the spoiler drain holes. The water just ran off, practically refusing to bead and where it did bead just ran off with the slightest of nudges. Seriously, I have never seen anything like this. The benefit is, dirt carried in rain or other water will have no chance of sitting, drying and leaving deposits - the water just rolls off the panel. Stunned! It bodes very well ... I'll hopefully polish up and seal the sides of both cars this week. I'll be using C2 as a QD to maintain these areas. I've found a new best friend . I just hope it lasts as well as the claims. As you've found out a little goes a very long way. In overcast skies, I don't think it achieved quite as much as I am used to ... on MY white. I am a VERY exacting customer, though. I think it will do the job I want it to and do it very well. Again, I reserve judgement until I see it for what it is. I often say about sealants like Finish Kare 1000P ... when you see it, that'll be all you see. So far, I am impressed with C2 for pretty much everything, but I've not "seen it". Dunno if you noticed but ibn my recent Prima Banana Gloss thread i mentioned i found that the G1 coated glass is 'clean' after a wash and i havnt had to use the usual AG Fast Glass after a wash to spruce the glass up as its 'just clean'! Also have to say after applying the g1 with the pads it seems like the way to go although Rob and others say to use an MF. Yes, I have also found that the windscreen is clean .. bug splats come off with a very minimal wipe over. I've not used a glass cleaner on any treated area since application! I do tend to use a waxy shampoo - Finish Kare 1016, and we're warned against it by Gtechniq for C1/C2 and C3 finishes. Where I have got suds onto glass coated in G1, it doesn't seem to make any impact at all - the glass stays clean and whatever hits it rolls straight off. I think I'll switch to either Autoglym Bodywork Shampoo & Conditioner or Dodo Juice Supernatural for maintaining C2/C3 finishes - they are non-waxy but do have a gloss. C2 as a QD should remedy any issues. I love the look but I guess it will take on a different look depending on the cars colour. 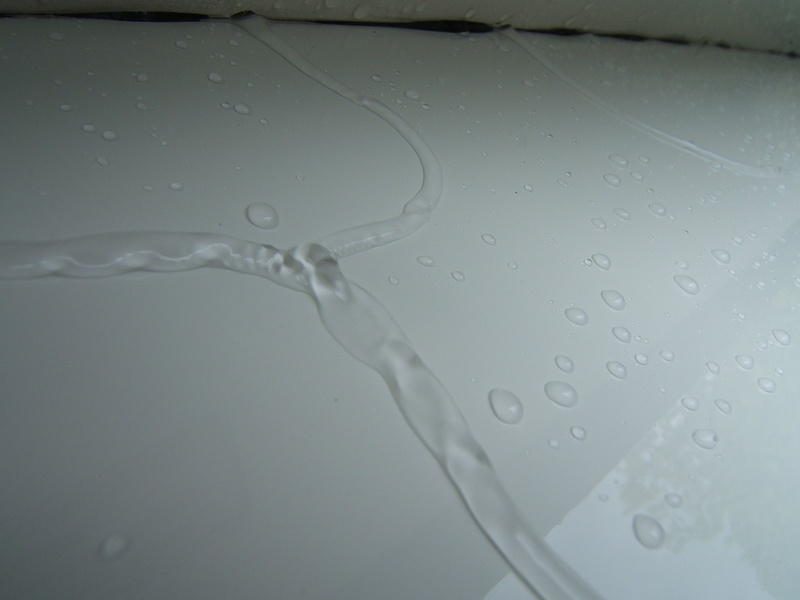 ... we are so confident you will love the look, durability and ease of application we guarantee your previous favourite pot of wax will soon have a layer of dust on it and you will be out enjoying your car instead of labouring on removing wax residues from panel gaps and trim! That does scare me more than a little, since I do so enjoy using waxes and sealants. That said, I have vowed to leave top panels since I do enjoy playing with waxes. Put it another way, if the "present" (or even the "future") is so perfect, why do so many of us drive cars that are decades old? ... now where's the bag of popcorn smilie? It ca only be C3! If this is the shape of things to come we wont even need to wash our cars soon! Oh and Paul, did the bug slide off the boot?? I read about AQuartz a good couple of years ago - there was a trend towards these "glass" finishes (because they contain silicum, or something like ... which when applied with head ... head? EDIT: HEAT ... becomes a kind of glass) and it looked even then like the next big thing. I think Gtechniq have it well placed for all manner of ancilliary finishes - glass, cloth, leather and so on. I can see all kinds of disaster with the paint coatings and I think it will, for the most part, be offered as a professional application or used by a few skilled or adventurous enthusiasts. The "normal" end of the market are unlikely to take it on due to cost and will carry on with what they see on the shelves of Halfords and I think the majority of enthusiasts and professionals will carry on in the traditional manner, perhaps working some of these products into their routines for additional longevity of finish. I think it will be a LONG time before we drop the notion of waxing our cars. So, CYC to be selling AQuartz ... good stuff! I'm keen to try their gear, too, but I think I have enough on my plate at the moment with Gtechniq. Last edited by pjgh on Tue Jun 01, 2010 8:48 pm, edited 1 time in total. Totally agree Paul, i like the GTechniq brand and the fact that they have Pro stuff and also stuff for me to use. The AQuartz looks like a chew having to use heatguns and all that jazz! The Ironcut stuff i mentioned seems interesting though. If i could just spray my wheels with the PW, give them a quick rub with shampoo and mitt and they were spotless i'd be over the moon! Did the bug slide off then? just looked at that IronCut stuff, wowwy. Could do with some of that as I've still got some particles on the roof. I like the way Iron Cut "reacts" and goes purple - you can see it working.